Thu., Dec. 21, 2017, 5:25 a.m.
Don Childress is lucky he hasn’t had a garage sale in the past few decades to clear out unused fly fishing gear. The Sandpoint angler says an old, soft, fiberglass rod was the ticket to landing the Central Washington trout of a lifetime out of Rocky Ford Creek this month. 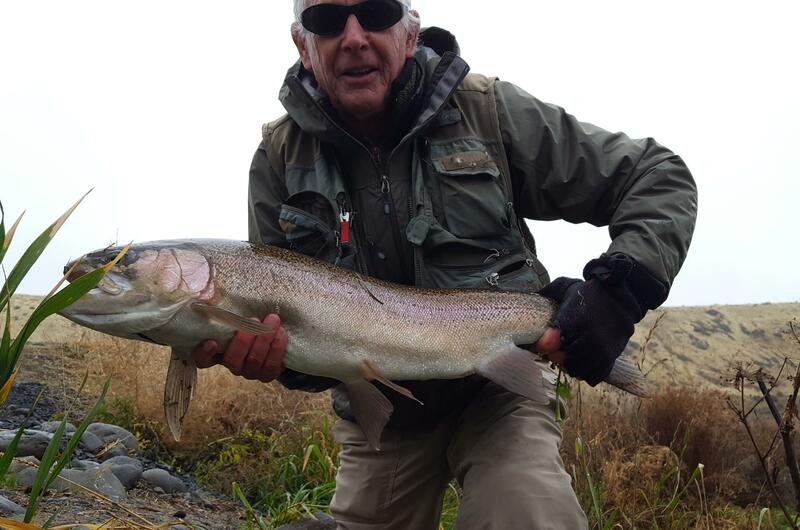 Childress caught and released a 30-inch rainbow from the fly-fishing-only stream while sight-fishing with a Size 20 scud pattern on 5X tippet. Rocky Ford, about 20 miles north of Moses Lake, emerges from the ground in the drylands as the product of irrigation runoff. The stream offers fly fishers a 3-mile spring creek experience. Because the water surfaces at roughly 52 degrees at Troutlodge Hatchery, the stream doesn’t freeze, making it particularly attractive to anglers seeking open water and active fish in winter. Fly fishing is allowed year round with single barbless hooks and no bait. But with no wading allowed, it can be tricky to land rainbows of any size from the tule-lined shores, especially in the glassy flat sections where fine tippets are used to avoid spooking fussy fish. Childress described the 9 1/2-foot fiberglass rod, which was popular in the 80s, as a really soft, almost wimpy 5-weight. He said the virtues of the soft rod were immediately apparent. “I was breaking off fewer fish at hookup and even as I manipulated the fish round the weeds,” he said. Patience and discipline are required to hook trout in the shallow waters of Rocky Ford Creek regardless of the rod choice. After spotting the huge rainbow, Childress said he made about 30 casts. He was using a 12-foot leader and casting about 20 feet upstream from the fish to let the gentle but sometimes squirrely currents naturally drift and deliver a fly about the size of a mosquito. “The scud had no weight and there was no indicator, so I couldn’t actually see the fly,” he said. “I try to get it down close to the bottom by the time it gets to the fish. I only had a rough idea where the fly was. There’s an art to setting a hook on a 10-12 pound trout with what amounts to a thin curved barbless wire attached to a fine tippet that tests to less than 5 pounds of strength. About 20 minutes later, Childress guided the rainbow to shore. “It was way too big for my net,” he said. Fishing partner Julie Kallameyn helped him land the trophy, where they measured it at 30 inches before snapping a photo and releasing it to test the rod skills of yet another angler in Rocky Ford. Published: Dec. 21, 2017, 5:25 a.m.